Rodetrip is still in Portsmouth. We had an anticipated departure of this morning to start heading for Portland, ME but the weather had other plans. The National Weather Service calmly describes our current weather as a low pressure system heading gradually out over the gulf of Maine. For us that means that we are getting bands of thunderstorms, spaced throughout the day. We decided that even though we are ready to head north, we aren’t in a big hurry to go running headlong into thunderstorms. A low pressure system also will bring with it a counterclockwise flow. This means that if the low pressure is just offshore from us, then the wind is coming out of the North. Since we want to go North having the wind come from that direction is not very helpful. Shown below is a wind map that I downloaded from PocketGrib, the newest app addition to the iPad. Each arrow on this map indicates a predicted wind direction and speed. 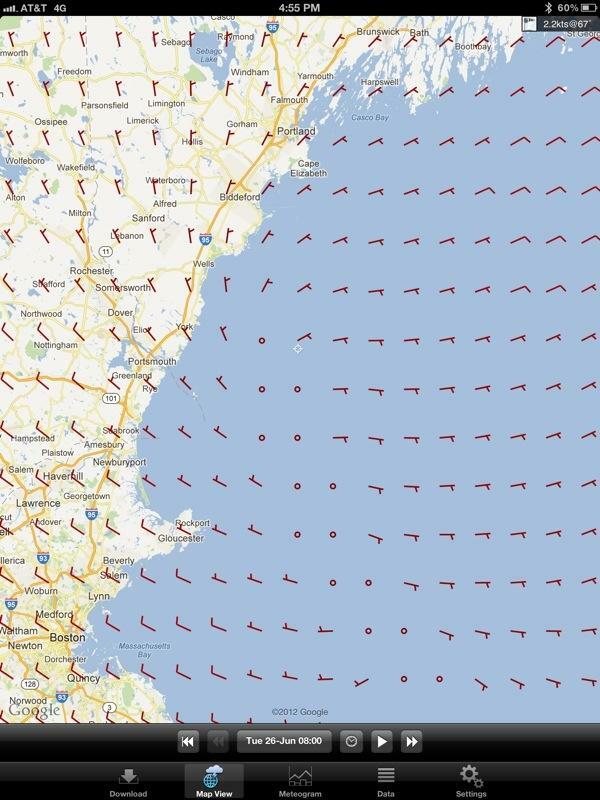 The O’s a little offshore and partway between Portsmouth and Portland indicate that there is NO predicted wind. That does not make for fast sailing. Anywhere that wind is predicted, an arrow appears on the map. Each arrow has a “tail” on it, each half flag that is on the back of a wind arrow represents 5 knots of windspeed. 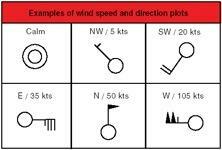 Here are some example wind indicators. After looking at the wind arrows on today’s weather map we decided that fighting through a calm and a headwind while standing in the rain and dodging lightning sounded like less fun than waiting on the mooring for one more night and heading north tomorrow. I expect there will be lots of times that we will end up waiting for an appropriate weather window before we set off on a passage. 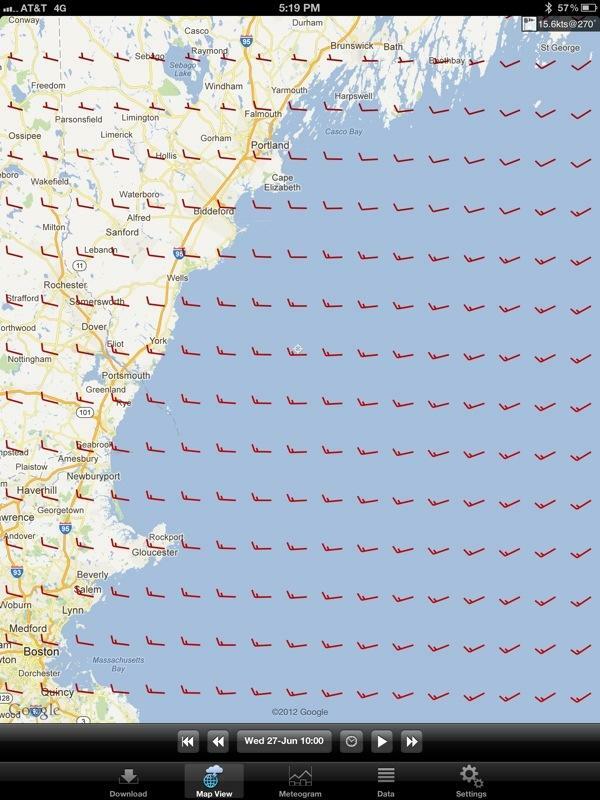 Here is tomorrow’s wind map it looks a lot better! This entry was posted in Uncategorized and tagged navigation, planning, weather, wind by Brian. Bookmark the permalink.